Fashion Challenge - day 7 (which was on Monday, but I didn't post the photo yet). 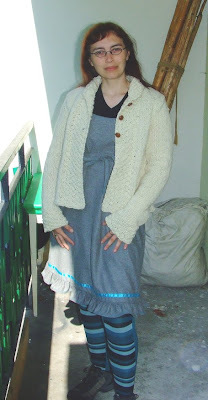 It was fun to look through my clothes and see what I made/re-made, I may repeat this challenge next Summer, when there are warmer days for sleeveless dresses and tank tops with skirts! ^^ (Unless I make/remake a whole bunch of long sleeve blouses up till then, you never know! ^^). 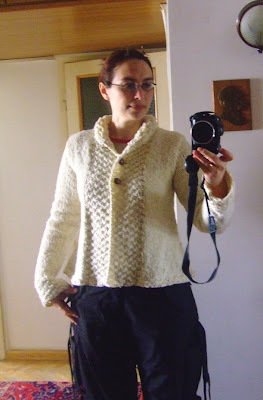 Here is the shot of me wearing my Drops Jacket, taken at my parents' place. The Drops jacket looks fantastic - you are going to get a lot of use out of it.